Of all the different forms of exercise, that’s available for fitness, one of the most underrated is Fitness Walking. Before we discuss the benefits of fitness walking, let’s understand what it is. When we walk normally we often call it a stroll. During a stroll, we are usually not conscious of the body’s movements. Our breathing rate is only slightly higher than when at rest. The muscles in our body are being used but not exercised. Fitness walking, on the other hand, is done consciously. We still walk as before but focus on technique and pace. It is also popularly known as power walking. 30-minute walk a day can reduce your risk of coronary heart disease, osteoporosis, breast and colon cancer, and Type-2 diabetes. You maintain good walking posture, step up the pace and engage your core. As you progress, you will be able to pace yourself so that your breathing rate is increased yet you are not out of breath. It is not about walking too fast or over-striding. This makes you short of breath and tire quickly. It is not about moving your arms too fast or vigorously. There are no additional benefits in doing this. Do not look down all the time during the walk. This leads to poor form and technique. Do not tense your upper body. This strains the back and also results in poor form and technique. It is not advisable to carry hand weights or place weights on your ankles. Do not get too distracted when walking. If you do, simply release the distraction and come back to the present moment. To maximise results, pace yourself and stay focused on engaging your core. As fitness walking is an aerobic activity, you will ideally need proper walking shoes and be suitably clothed. How far would you walk for fitness in a day? It’s really up to you. Personally, I try to keep to the recommended 10,000 steps a day (which is roughly 5 miles). An activity tracker like Garmin Vivofit 2 is the perfect fitness companion that will keep you motivated. There are many so benefits to fitness walking, I could go on forever :). My top 10 are listed below. 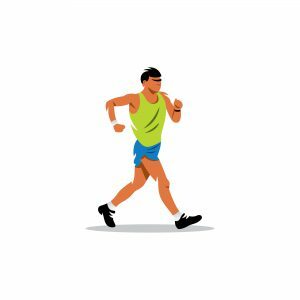 Fitness walking is a moderately aerobic activity and improves cardiovascular fitness. Studies have shown fitness walking to greatly reduce the risk of the major NCDs (non-communicable disease), including type 2 diabetes, cardiovascular disease (heart disease and stroke) and musculoskeletal conditions such as back pain. Fitness walking burns nearly the same amount of calories as jogging yet it is easier on the body. Tones and strengthens the muscles in your body and gets you fit. When proper form and technique are maintained during fitness walking, the body is exercised optimally. As you get stronger, you may need to consider a strength training program to compliment your fitness walking. Helps in reducing cravings and other addictions like smoking and naturally, promotes the desire for healthy eating. I always go for my fitness walk before I eat. Not only do I get the exercise out of the way, I also end up eating a smaller portion. And I also find myself going for the healthier foods. Win-Win-Win! You will notice an improvement in the quality of sleep at night. It is important to note here that you try and finish your fitness walk at least 3 hours prior to bedtime. Or even better, get it out of the way earlier in the day. This is because any form of exercise causes the release of hormones that make one alert. You will experience improved energy levels during the day. This is probably why the best time in the day for your fitness walking is first thing in the morning. A moderately aerobic activity coupled with the release of ‘feel good’ hormones in the body will set you up for holistic success in mind, body and spirit! Your mental well-being will improve. Things that caused anxiety earlier will no longer have the same hold on you. You will experience less stress overall. It’s those awesome ‘feel good’ hormones again! They are the primary reason for feeling ‘euphoric’ after your fitness walk. Read about them here. Many aches and pains resulting from a sedentary lifestyle fade away. The muscles in the body are being flexed during fitness walking and aches and pains due to inactivity are reduced as a result. Improves the body’s overall metabolism and also helps in detoxing the body. Detoxification is an essential bodily function which is greatly supported by regular exercise. Ridding the body of excess waste leads to a stronger immune system, weight loss, and many other health benefits. Last but not least, you can do this with a friend. It’s fun, make it social. It’s fun to buddy up with others and do it together. Not only do you get to exercise, you get to strengthen bonds with colleagues and friends. Are you a fitness walker? Please share your experience in the comments section below. I would love to hear from you and read your experience. Note: If this is your first time to the site, see what we are about here. ← HIIT vs Steady State Cardio for Fat Loss – What is the Best Approach? I am into fitness and I have never tried fitness walking, but your article on it might have just made me start to fitness walk !! Furthermore it is very true that just 30 mins of walking a day will reduce your risk of coronary heart disease, osteoporosis, breast and colon cancer, and Type-2 diabetes. So ill let you know how it goes !! Great to know that you are now considering fitness walking. The health benefits go up exponentially over the long term, so do make sure fitness walking is part of your long term plans. This post really makes me want to take up walking as a regular routine. I did not realize it is just as effective as running. You have some very good benefits listed that will capture the attention of many readers. I liked how you defined what walking is and what it is not so that you were able to set the stage for list of benefits. Very interesting and captivating post. Thanks for your comment Luis. Glad you found the information in the article interesting and are thinking of fitness walking as a regular routine. The benefits accrue the longer you practice it, so making it a part of your regular routine is a sound investment for your health. Fantastic way to keep in shape. This is the type of exercise I recommend to a lot of people who find the gym to be a little intimidating or time consuming. I’ll make sure to point them this way next time for proof. Great article, thanks for the information! Thanks for commenting Ryan and for recommending the article to others. Great that you found the article useful. You are absolutely right, fitness walking is an excellent exercise form with many benefits for those who don’t have the time to head for the gym. This is something everyone should pay attention to. I absolutely agree. If you are consciously thinking about the way you are walking, you’ll achieve a better result. Also getting outdoors and enjoying nature is also a bonus. Very informative article Sandeep. Glad you found the article informative. Great point about getting outdoors and enjoying nature. It is indeed one of the bonus benefits of fitness walking and has a positive impact on the mind, body and spirit. Thanks for your comments Andrew. Just got back from taking my dog on a long walk this morning! I’m dealing with a lower back injury and it’s really the only form of exercise I have right now, but it keeps my brain balanced and helps me stay energized regardless! Thanks for your comment Ian and sorry to hear about your lower back injury. One of the benefits of fitness walking is an improvement to musculoskeletal conditions such as back pain. Glad to see that it’s keeping you balanced and energised too. Wishing you a speedy recovery. Interesting, I’ve been into fitness for a long time but I’ve never even considered fitness walking. I’ve always been one of those guys lifting that iron up and down. This would definitely be a change for me! Thanks for commenting Matt. I agree that many of us would think the same and would add that fitness walking combined with weight training as part of a fitness plan would result in huge health and fitness benefits. What tips do you have in terms of posture during a fitness walk? Maintaining the correct posture is key if we are to benefit from fitness walking. Some of us maintain good posture naturally while walking, many others struggle due to years of bad walking posture. One of the most important contributors to maintaining good posture while fitness walking is breathing. When you ensure that your breathing is deep and regular, the body posture is naturally corrected with little effort. I mentally count my steps. When I start my walk, I take four steps while inhaling and 6 steps while exhaling. This brings a sense of rhythm and pace to my fitness walking routine and controls my breathing and attention. Over time as my fitness has improved, I have increased to 6 steps while inhaling and 8 steps while exhaling. •	I gaze straight ahead as much as possible and not look down. •	I keep my upper and lower back straight and avoid the tendency to bend slightly. This is a challenge especially when walking up or down hill. I adjust my pace in such cases so that I am able to keep the body straight. •	I engage my core muscles while walking. I notice that doing so also ensures that my posture is correct. •	I don’t swing my hands too vigorously when I walk. I just do what comes to me naturally. •	For correct posture, it is important that your walking routine stretches you beyond your comfortable walking pace. At the same time, walking too fast will throw you out of balance resulting in bad posture. Find your right pace. •	I carry a runners water bottle and sip from it frequently. This keeps me hydrated and helps me focus on my walk and posture. Thanks for your comment Darcy and great to hear that you are considering fitness walking again. As you are an experienced walker, I am sure your weight loss and fitness goals would be achieved easily when you put your mind to it. You may find my article on Achieving Fitness Goals helpful in speeding up the process. My mom loves fitness walking and she keeps trying to get me to do it. Personally I’ve always loved running more but I recently injured my back and am supposed to avoid running for a while. So maybe I’ll give it a try! You make it sound a lot more fun than my mom did haha. Also, I had no idea that it burns almost as many calories as running – now that’s pretty cool. Interesting little fact about it being as effective and less stressful than jogging. I didn’t know that. I also didn’t know that it can reduce risk of colon and breast cancers. Do you know how it does that? Thanks for your comment Justin. And yes, I agree fitness walking does present many interesting facts and benefits related to long term health and fitness. You raise an interesting question and I am not quite sure if there is a precise answer. Studies in the United States and around the world have shown that regardless of BMI an increase in physical activity (such as fitness walking) can significantly reduce the risk of Colon and Breast Cancer. The main intention here is for us to leverage what established world renowned institutions have collectively studied and concluded.